Miss Power has come to Earth from outer space along with her sidekick, Captain Giggle Cheeks to teach WordGirl everything she knows, which includes using mean words against others. Is she a super hero or a super bully? 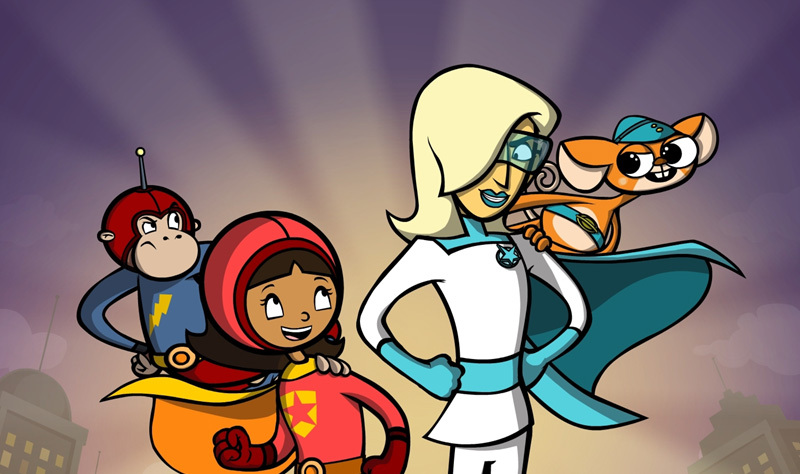 WordGirl The Rise of Miss Power comes to Family Movie Night on WXXI Kids 24/7. Jane Lynch guest stars as super hero turned super bully Miss Power who comes to Earth to teach WordGirl the power of mean words. Besides using her super strength and super speed to defeat villains, Miss Power has another secret weapon: using mean words against others. WordGirl would rather not use her words harshly…but after giving it a shot, she feels empowered. Soon, everyone starts wondering "what has gotten into WordGirl?" when WordGirl tries to stand up to Miss Power, she gets belittled and stripped of her super hero star. Dejected and sulking, Becky goes home to her family. But Miss Power is there to take Mrs. Botsford away! Will WordGirl be able to save her mom and defeat Miss Power without sinking to her level? Watch “The Rise of Miss Power” on WXXI Kids 24/7 (TV 21.4/cable 1277/1278) Friday, Saturday, or Sunday. Get ready with these games and activities! WordGirl vs Miss Power Face-off: Help WordGirl defeat the Villanous Miss Power in an EPIC battle against her MEAN vocabulary! Miss Power isn’t very nice, and WordGirl defeats her by using words that are kind instead of hurtful. You can practice being kind with this Compliment Card game from WORDGIRL. Who’s your favorite character in WORDGIRL? You can explore your favorites, play games and download a new bookmark (for your New Year’s Reading) at pbskids.org/wordgirl. Empathy: So Funny, I Forgot To Laugh: An Arthur Interactive Comic: Learn more about the power of words to hurt or help. Video Collection: Kindness, Empathy & Resilience to discuss bullying from PBS LearningMedia.